Readers: Where in the world is TGOM? TGOM: Enjoying a Southern California summer offline. TGOM: I know! I'm familiar with my inbox. Indeed I appreciate being missed. Readers: Give us something! Anything! Readers are eager to spout off about this... and other randomness. Kasey Kahne, his non-gayness and his seemingly never-present girlfriend - Kasey Kahne status: Not gay, has girlfriend. Despite what British sports mags rags claim, Kasey is, by all accounts in this hemisphere, nothing more than a common heterosexual male. Many fans, however, are in a continued state of denial regarding Jenny Severance's prominence in Kasey's life, despite his own acknowledgment of having a girlfriend, confirmation from TGOM sources and her presence at fan events and races. Snapped @ Lowe's Motor Speedway (at right, photo: nn52) as well as @ NHMS with her son in tow--just to name two. Kyle Busch and Samantha Sarcinella - NASCAR's most popular couple of 2008. If I didn't feel the same way, I'd find the fans' gushing over how cute these two are utterly nauseating. Robby Gordon, his unproud papa status and recent social-networking nightmare - Baby mama dramarama! Former members of Robby's Uprising say that candid discussion of the the #7 team's struggles this season became an issue on the driver's fan site as many team members, sponsor employers and marketing reps were site participants and were privy to the criticisms. They also confirm that the fans' desire to discuss Robby's personal life could not be curtailed and was a constant challenge for site admins. With regard to the site's "indefinite hiatus," however, insiders cite a different reason altogether: Robby's running off to new girlfriend so shortly after Max's birth was more than the new baby mama could handle and she found an outlet -- and audience -- on the Uprising, which led to its ultimate demise. #1 most-anticipated but unasked question on Tuesday's teleconference: "Robby, how has fatherhood changed your outlook on life?" Former devoted Robby fan: "I don't think I can love him like I used to anymore! ... I cannot believe all of this! WHY hasn't he said anything about the baby still?! It's so weird! People know--just say something!" Kelley Earnhardt Elledge's love life - It's official. Multiple sources confirm that Kelley Earnahrdt and former JR Motorsports driver Mark McFarland are "dating." And apparently victory lane isn't the only place they can't keep their hands off of each other-- last Friday night, they were spotted with their tongues down each others' throats in a dark corner of On the Roxx. Sources are also quick to remind that Kelley and husband Jimmy Elledge have always had what others might refer to as a "strange" or "open marriage." I have found no evidence -- as of yet -- that there has been any discussion of divorce, however, Kelley seems to have dropped the use of Elledge in press releases and such. Dale Earnhardt Jr.'s love life - Fans wonder, given his immediate family's history, is it any wonder he's hesitant to settle down working towards the ultimate goal of marriage? The endless questions "who is Dale Earnhardt Jr. dating?," "Who is Dale Jr.'s current girlfriend?," etc., etc. bore us to tears. Collectively, various sources report that he currently has anywhere between one and three female companions (which has pretty much been the status quo since the inception of Answer this...). What any of the alleged three mean to him is anybody's guess. Yes, one of them is fan favorite (!) Elizabeth Peschock. Some are even refering to her as a *girlfriend* again, but TGOM isn't that generous with labels until applied by the actual parties involved. Of course to some, the obvious solution to Dale Jr.'s problem - if indeed his inability to find the perfect mate is to be considered a problem - is: Athena Barber. She's a purty, good country girl, just like Grandma Martha Earnhardt hopes for. 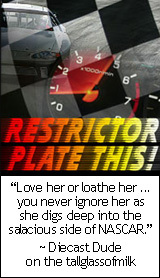 Speaking of ... 2007's Hottest NASCAR WAG - Gentlemen, you'll want to point your browsers to FHMOnline. The stunning -- and available -- Athena will be gracing their pages in the near future. Team owner Joe Gibbs (right) and president J.D. 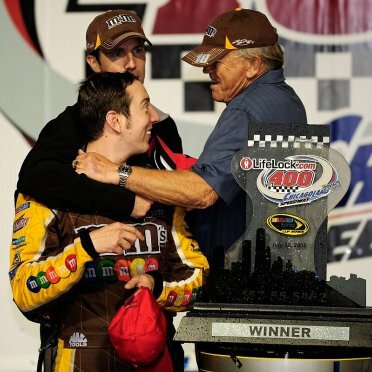 Gibbs congratulate Kyle Busch after his seventh NASCAR Sprint Cup Series win of the season. Who could have guessed this time last season that first-year Joe Gibbs Racing driver Kyle Busch and his Hendrick Motorsports replacement, Dale Earnhardt Jr., would be holding down the number one and two spots? Probably a lot of us. Kyle Busch and girlfriend Samantha Sarcinella prior to the start of the NASCAR Sprint Cup Series LifeLock.com 400 on July 12, 2008 at Chicagoland Speedway. Not News: Kyle Busch wins a race. News: The fans booed cheered! Not News: Tony Stewart gets annoyed with media in post-race interview. News: Stewart exercises restraint commenting on an incident. Rick Hendrick is non-committal about (soon-to-be-daddy) Casey Mears' future beyond this season. Mark Martin is not returning to DEI. Some are already speculating that Martin is headed to HMS to split the season in the #5 with JR Motorsports' Nationwide Series star Brad Keselowski. Others think the #5 will carry Martin Truex Jr.'s name on it. I'm sure MTJ has plenty of options--maybe he'll shed some light on his future in his press conference scheduled for Tuesday. What is DEI's contingency plan? Think they're panicking yet?